This small granule, natural clay clumping litter from Greenwoods has an effective, fast-clumping action and is extremely absorbent. Greenwoods Natural Clay Clumping Cat Litter is made from Canadian natural clay with green zeolite, a natural mineral crystal with a complex structure which locks in bacteria and odour. At Greenwoods your pet's well-being is the highest priority. The Greenwoods Natural Clay Clumping Cat Litter with Zeolite can absorb up to 320% of its original volume, it is 4 times more efficient than traditional litter. 99% dust-free, this fine granule formula reduces tracking to a minimum and doesn't stick to your cat's paws. The rapid clumping ensures that bad odours and bacteria are locked in so your cat always has a clean, hygienic litter tray. This is especially important in multi-cat households. Life's more pleasant with Greenwoods Natural Clay Clumping litter. 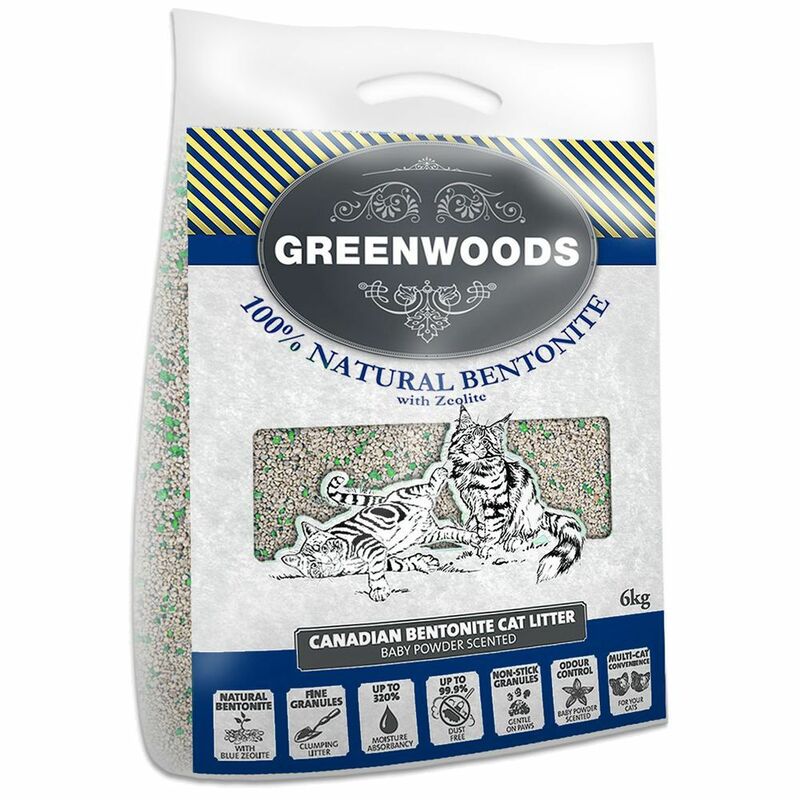 Greenwoods Natural Clay Clumping Cat Litter with Zeolite at a glance: Quality cat litter product made in Canada A very fine, natural clay granule litter, very economical and absorbent: Greenwoods Bentonite Cat Litter is highly absorbent. It can absorb up to 320% of its own volume which makes it very economical and 4 times as efficient as traditional litters. Green zeolite absorbs nasty smells and bacteria: Green zeolite is a natural mineral crystal with a complex honeycomb structure which quickly locks in bad smells and bacteria 100% natural: Greenwoods Natural Clay Clumping Cat Litter is made from top quality clay and natural zeolite. It is free from chemicals. Pleasant babypowder scent: With a babypowder fragrance from natural oils. Virtually dust-free: This litter is very low in dust. This is important for elderly cats and those with allergies. Gentle to paws: The fine grains do not stick to paws. Suitable for multi-cat households For best results remove soiled clumps several times a day and add fresh litter as needed.